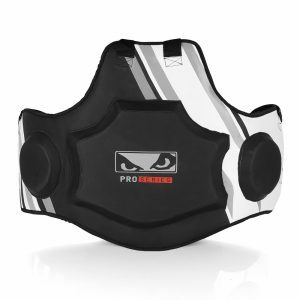 The Bad Boy Pro Series Advanced line is designed to surpass professional athletes’ and Combat Sports competitions requirements. The Bad Boy Pro Series Advanced Body Pad has been tested and approved by the Californian Alliance MMA Gym, where some of the deadliest strikers train. Constructed for the highest intensity coaching, Hayabusa’s Pro Training Series Body Protector ensures maximum protection achievable in pad technology. This specialized lightweight body pad offers complete mobility for the trainer, while absorbing impact from the most significant of strikes. Fairtex Thigh Pads are constructed of leather and feature a four-layered padding system of hard outer padding and extra soft inner padding for ultimate shock absorbency. They are designed to help develop leg kick speed, timing and accuracy. Fairtex Trainer’s Protective Vest designed for punches, hooks, foot jabs, knees and combination drills with front and side white hitting targets. adidas WTF Approved Body Protector shields your chest, stomach and groin.This durable protector is made from foam rubber padding enclosed inside a vinyl shell. The crisscross back ties ensures a secure fit and holds the guard in place while sparring. World Taekwondo Federation (WTF) approved. The Everlast Pro Coaches Vest is engineered for competition or sparring. It features three padded hit targets, adjustable shoulder straps, hook and loop waist strap, C3 foam protection and EverDri moisture wicking lining.